It’s time for another film based on a real life event. A lot of people have died on this mountain throughout the years. The number will continue to grow as well because people can’t resist a challenge, even if it is a life threatening one with no real reward. (Except satisfaction I suppose) This film chooses one such expedition where most of the people died, but there were some survivors. It’s certainly a lot more well done than the other real life based stories that I’ve seen lately, but I still wouldn’t say that it’s really my kind of film. Although, it definitely does seem pretty faithful as far as adaptions go. For starters, the characters are mostly reasonable. It’s a shame that most of them have the same design so it’s easy to mix people up, but I guess that’s how it goes in the cold. Most of the characters are here to climb the mountain so they stay professional, which is always a change of pace. The leader (Rob) in charge of the main explorer group wants to make sure that everyone climbs the tower safely and is probably the best character in the film. It’s a shame that he had to choose such a dangerous occupation. Scott isn’t quite as good and while he’s pretty confident the whole time, he wasn’t as cool as the other people. He was reasonable though so I’ll give Scott props there. There was also a cynical explorer who kept on making wisecracks the whole time, but he did have one moment where it was easy to lose a lot of respect for him. He nearly fell to his death while on a ladder so Rob quickly saved him. Instead of thanking Rob, the guy just started yelling about how entitled he was feeling and one could tell that the salt was very real. It’s hard to recover from a scene like that. The old lady was a good character to root for since she had already climbed 6 out of the 7 biggest mountains in the world. Climbing this one was a matter of honor now. If you saw my review on The Perfect Storm, you can imagine that I basically scoff at the notion of ever attempting such a feat. I’ll stick to my video games instead of risking my life on such a dangerous mountain. If I ever want an adrenaline rush I’ll quickly head to a Super Smash tourney, but beyond that…I’m pretty good at this point. The mountain certainly looks good there so at least you’ve got the view to think about. I’m sure that climbing the mountain is much safer and quicker nowadays than it used to be, but it probably won’t be completely safe for a long time, if ever. We’re going to need some next generation clothes to warm up the body during the climb. Then it’ll finally be more feasible to go on the quest, but all it takes is a slip and game over. It was neat to see the Helicopter essentially slide down to escape the mountain. I feel like Military Grade helicopters and planes should be able to reach the top with minimal effort by now, but I wonder if the standard ones will ever be able to go that high and land safely with all of the wind and ice that is around. It would be tough, but definitely a nice cop out for people who don’t want to take the extra risks of walking all the way up. The film definitely seemed to take some shots at the fact that the mountain is now commercialized. It does seem a little crazy that it has become such a popular destination. At this rate, you’ll be able to add the Moon to that list as well someday. I certainly wouldn’t want to arrive on Everest to see everyone hanging out. I’d like to go there and it’s empty, as if I owned the whole mountain. That’d be pretty hype. One thing I would recommend to future explorers is that you choose your partners well. You don’t want to receive half empty air canisters or have a partner who shows up 30 minutes late and forced a few people into an early grave as a result. Everyone wants to be on point because if one guy slips up, everyone else will join the slide. Then their flags and speeches won’t mean quite as much since your family would rather have you wish them than a speech. The moral here is definitely that family comes before crazily intense risks. One last thought that I had was that it would probably not be all that hard to build an installation on Everest. I’m guessing that there would be a lot of global tensions around that, but making a structure would make the climb a lot easier. People could actually live in this building and it could shelter travelers during the night in a separate area. I’m assuming that this hasn’t been done because it may not be feasible for some reason or it would take the fun away from the adventure. If it’s the latter, then I hope that this happens ASAP. Safety before fun folks. 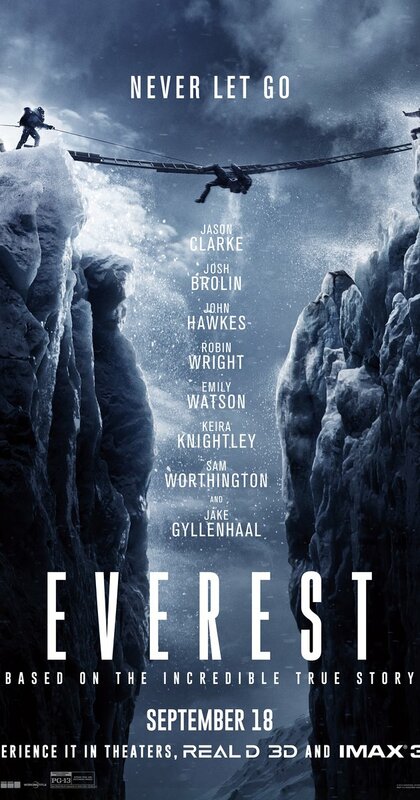 Overall, Everest is a pretty good film based on a real event. I feel like they probably could have chosen just about any expedition where a few people died and one survived, but this one was certainly a very incredible story so it’s as good as any. The film tries hard for the emotional appeal and I feel like it would succeed a little more without that, but it’s to be expected in a crisis film like this one. I think deciding to name the baby while dying is a little selfish since there’s no way that the wife will switch it now, but in the end it’s just a name. If you’re looking for a good real life drama/thriller then this is a good one to check out. Now we just need to see which mountain will get a film next time! This entry was posted in Live Action Movies and tagged Based on a True Story, Disaster, Everest, Ice, Mountain, Thriller by dreager1. Bookmark the permalink.